Rural households in Ethiopia are exposed to a variety of covariate and idiosyncratic risks. In 2005, the Ethiopian government introduced the Productive Safety Net Program (PSNP) and in 2011 launched the Community Based Health Insurance Scheme (CBHI). This paper analyses the interaction between the two schemes and their joint effect on health care utilization, labor supply, asset accumulation and borrowing. The empirical analysis relies on three rounds of individual-level panel data collected in 2011, 2012 and 2013 and on several rounds of qualitative work. We find that individuals covered by both programs, as opposed to neither, are 5 percentage points more likely to use outpatient care and are 21 percentage points more likely to participate in off-farm work. Furthermore, participation in both programs is associated with a 5 percent increase in livestock, the main household asset, and a 27 percent decline in debt. 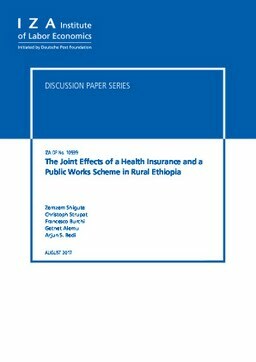 These results suggest that at least in Ethiopia bundling of interventions enhances protection against multiple risks and shows the potential of linked social protection schemes.